We are extremely fortunate to have a separate facility for gymnastics, allowing us to keep equipment set up year round. Jennifer Jubec, Gymnastics Coordinator and Kari Harkins, Head Coach, bring tremendous knowledge and expertise to our gymnastic program here at the YMCA. Please review the descriptions for our youth lessons, private lessons and gym team. 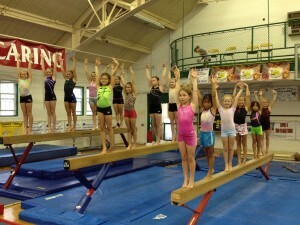 Gymnastics Classes: Jennifer Jubec, Gymnastics Coordinator j.jubec@gbgymca.org or 724 834-1367. Greensburg YMCA Aerials: Kari Harkins, Head Coach, harkinsgbgymca@yahoo.com or 724 834-1367. Sports Director: Shawn Rause, s.rause@gbgymca.org, 724-834-0150 ext. 113. Children ages 18 months to 2 years old, along with their parent, will explore activities that include gymnastics, loco-motor activities and socialization. This is a class designed specifically to help participants transition from the Parent-Tot class into a gymnastics class without the parent. Two year old students who have successfully completed a session of a Parent-Tot class may enroll in this class. All three year old students may register. In addition to gymnastics skills, students will learn the importance of following instructor direction, and understand the importance of keeping a safe distance between all of the other student’s skill performance. This structured gymnastics program can be taken by girls or boys, ages 4 & 5 years old. This class gets kids started with floor skill progressions, balance beam, vault, trampoline and other basic gymnastic skills. This class is for children ages 6 & 7 years old. All equipment will be utilized. This class is for children ages 8 years old and up, beginner through advanced. All equipment will be utilized to help develop and practice gymnastics skills. Emphasis is on developing tumbling skills and techniques. This class is for children ages 7 and older. Students will work moving tumbling. Round-off back handsprings, back tucks, front handsprings, and front tucks. Won five state championship titles. To schedule Private Gymnastic Lessons, contact Shawn Rause at s.rause@gbgymca.org or 724-834-0150 ext. 113 or complete form HERE. The Greensburg YMCA strives to never turn any child away due to the families inability to pay for programming. With that in mind we will accept two forms of assistance in defraying the costs of camp. One way is through the YMCA Annual Support Campaign. The YMCA is able to grant scholarships to families in need due to the generosity of local businesses and individuals who donate monies to the campaign. We encourage those who may not be able to afford camp services on their own to complete a Financial Assistance Application and submit it to the Welcome Center of the YMCA. Please allow up to four weeks for processing. Additionally both Adventure Camp and Sports Camp accept payment from Child Care Information Services (CCIS). Families should contact CCIS of Westmoreland County to inquire if they are qualified (724-836-4580).